Carla Rivera Interiano was interested in her technology class at Parkdale High School in Riverdale Park, Maryland, but she found it tough to do some of the assignments. She was born without a left hand. 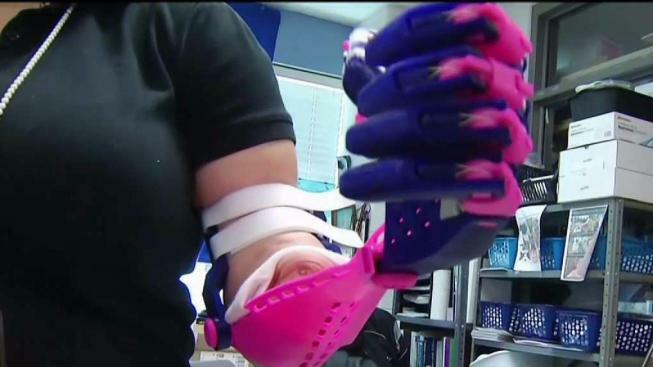 To help accommodate Rivera Interiano, instructor Karen Bogoski changed this year's curriculum so the class could make a prosthetic arm for the student. “Outside of the military, children are the biggest demographic in need of prosthetics, but they can’t afford it because it’s so expensive,” Bogoski said. The class used a 3D printer to build Rivera Interiano a pink prosthetic arm. Constructing the arm took several attempts, as one variation only had three functioning fingers, and another had excess wax and plastic. The project carried extra meaning for senior Timonique Crighton, an aspiring military robotics engineer. A $100,000 grant was used to purchase the equipment inside Bogoski’s classroom. There are only two such classrooms in Prince George’s County, though the county aims to have at least one classroom in every high school with comparable equipment. For Rivera Interiano, the technology proved to be life-changing.